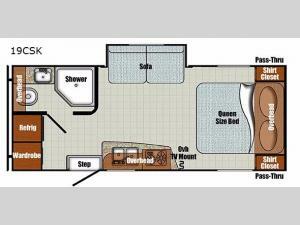 You will love the convenience that this travel trailer offers you and your guest. With the rear corner bath located straight in from the entry door you will have easy access from the outdoors when you need to use it. This unit also provides ample storage with a wardrobe cabinet, overhead storage throughout, plus under the queen bed you will find a power lift assist for stowing away larger items like blankets, plus more. On the outside, a front pass-through compartment features LED lights so you can easily find the outdoor games, camp chairs, and marshmallow roasting sticks when needed, even after dark.